Voice of the lost generation of the First World War. 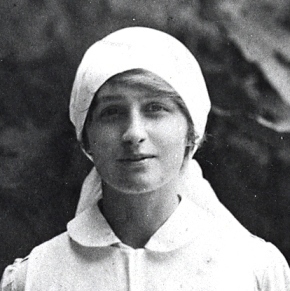 Vera Brittain (1914) was born in Staffordshire in December 1893. Just as the First World War was breaking out, she won an Exhibition to Somerville to read English. At the end of her first year she decided that her duty lay in serving her country and she spent the remainder of the war years nursing in London, Malta and France. She returned to Somerville in 1919, changing course to Modern History in an attempt to understand the origins of the conflict that had claimed the lives of her fiancé, her brother and two close friends. In 1933 she published Testament of Youth, a passionate record of a lost generation – one of the first accounts of the Great War from a woman’s point of view, and undoubtedly the most influential. She died in 1970 and in 1999, a collection of her letters and a large amount of research material used in writing her biography, were given to Somerville Library by her biographers Mark Bostridge and Paul Berry. The papers are now housed in the Vera Brittain Room in the College archives. Her daughter, Baroness Williams of Crosby the distinguished politician, is also a Somervillian.